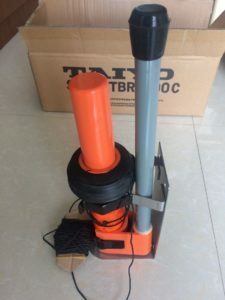 Summary: SART, whole name Search And Rescue Transponder, is a Radar based emergency transmitter that is designed to be stored in a liferaft or as a carry on device in the event that it is necessary to abandon ship. IMO changed SART(radar transponder) into Search and Rescue Positioning Device. The latter not only includes the original standard SART, but also a new standard AIS-SART, Both SART and AIS-SART are in compliance with the ship’s configuration requirements. According to the IMO regulations regarding ship configuration GMDSS equipment, sea ships over then 500 tons need to be equipped with two radar transponders(SART), 300~500 tons need to equipped with one pcs radar transponder(SART). 2007, 2008, IMO revised the GMDSS standards and revised the relevant sections of the SOLAS Convention, They changed SART(Radar Transponder) which is forced configuration into Search and Rescue Positioning Device.The later not only including the functions of Radar Transponder(SART), but also have automatic identification of search and rescue transmitter (AIS-SART). SART and AIS-SART can be interchangeable since January 1, 2010. AIS SART is a positioning device for marine rescue. It will automatically launch the ship’s (lifeboat / raft) identification and location information after launched. Other around ships and rescue aircraft who received such special information could quickly determine the location of the ship(Liferaft/ lifeboat) in distress, reduce search and rescue time. AIS-SART meets IMO MSC 246 (83) < Search and Rescue Purposes AIS SART Performance Criteria > (2007) standard requirements, and a parts of GMDSS. Since January 1, 2010, the ship can use the traditional RADAR-SART (search and rescue radar transponder) or the AIS-SART when configure SART. Both these two devices meet the requirements of the ship configuration. The Radar SART will transmit 9GHz radio signal when triggered by the radar signal. Through the radar to receive its launch signal to determine the location of the ship(liferaft/ boat) in distress. However, the RADAR-SART can not transmit its own position. The radar can only determine the approximate position of the RADAR-SART according to the scanning point azimuth and distance. AIS-SART built-in GPS receiver inside it, can send it’s own accurate location, easy to search and rescue. The AIS-SART operates on two VHF channels (CH2087, CH2088) and operates alternately on both channels. Usually, The ships who equipped AIS can receive AIS SART distress signals more than 5 miles away, the aircrat will be more farther, up to 20 to 40 nautical miles, even hundreds of miles. AIS-SART has its own unique identification code (nine digits), marked on the product shell, it consists of “970 + six digits”, such as 970261234, the product has been written into the product clip before boarding, once written can not change any more.